My friend, Casey, had a facepaint-themed birthday shindig at the weekend and this was my effort. I decided to go the whole hog, dressing up as Minnie Mouse (yet showing admirable restraint in not buying the disgusting Minnie-esque yellow heels I spotted in Primark). I've always wanted some Minnie Mouse ears! Thank god for eBay. The dress is Matalan. The zip broke as I was getting dressed. Refusing to change (or pull the dress back over my drawn-on nose and huge hair buns) I had to be safety pinned into the thing (thanks Sam). Hair is in bunches, which I backcombed and pinned into two buns. Eyes have everything on them. 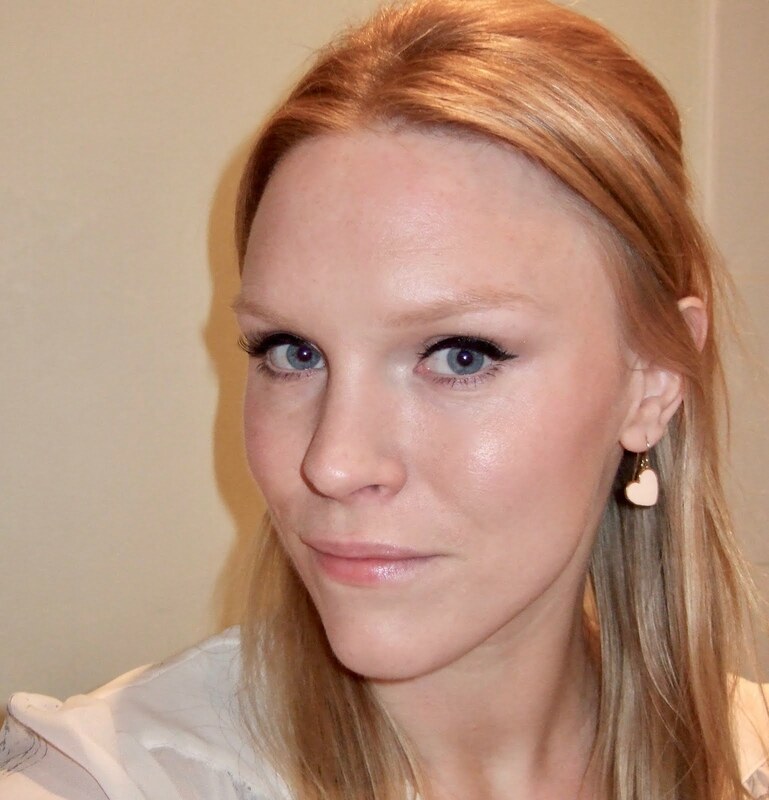 Star products proved to be Glam Crystals Dazzling Gel Liner in Le Freak and an old blue kohl Sephora pencil. Huge false lashes applied by Makeda (this was a multi-friend effort!) using Duo Eyelash Adhesive; Lancome Le Crayon Khol on my nose; lips blanked out using concealer and painted on smaller using Lancome Laque Fever in 110. This gave a fantastic vinyl finish but kept transferring to my teeth, no matter what I did. Hence Moody Mouse. 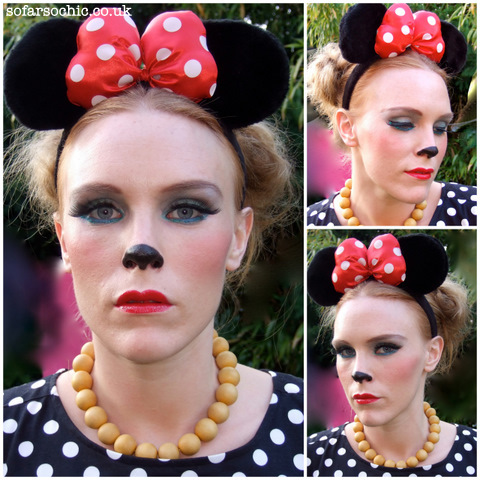 My makeup was very much inspired by this look on Doe Deere Blogazine, which is just immaculate, and this awesome Minnie Mouse-inspired competition entry by Kixih on YouTube. Thanks ladies! Had I known I could have sent you my Minnie mouse ears from a fancy dress party last year. I also have the hands. You looked gorgeous, i like red lips on you! 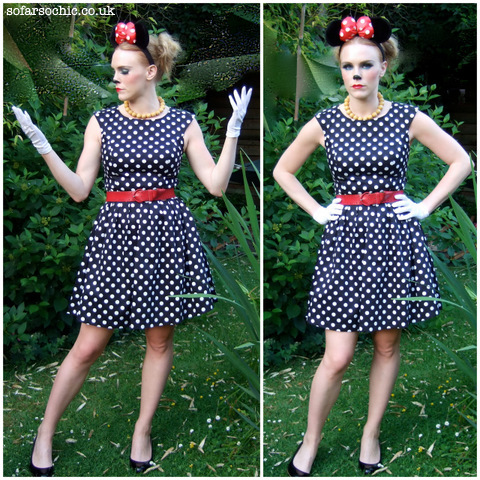 Fabulous, I'd love an excuse to wear Minnie ears! You actually seriously look even model-ier than you already are!